The Bond Street neighborhood in 1844 was already well established as an affluent residential enclave. Nearby on Lafayette Place was the white marble LaGrange Terrace, where wealthy homeowners like John Jacob Astor lived. Over a decade earlier the handsome Federal style mansion of Seabury Tredwell had been erected on East Fourth Street. Now Tredwell’s cousin, Samuel Tredwell Skidmore began construction of his own mansion, just three lots east of his cousin’s. He commissioned newly-arrived English architects Thomas Thomas and Son to design the upscale home. Unlike Tredwell’s Federal style mansion, the Skidmore home would be in the recently popular Greek Revival style. Red brick contrasted with the brownstone details. An especially elegant portico featured free-standing fluted Ionic columns. The entrance, with its sidelights and transom, was marked by a highly unusual paneled door which pretended to be double doors. Thomas Thomas and Sons' original 1844 watercolor and ink drawing is in The Winterthur Library in Winterthur, Delaware. The house at No. 369 Fourth Street (later renumbered 37 East Fourth) was completed in 1845. The Greek Revival style eliminated the peaked, dormered attic in favor of a low-ceilinged full floor with small windows. Here the Skidmore servants would live, including Mary Ann Banks. The nurse, who came to live with the family in 1830 after having worked for Skidmore’s good friend, attorney John R. Townsend, would have her hands full. Skidmore and his wife Angelina had eight children. The same year that construction began on the Skidmore house, William Sloane opened his carpet store at No. 245 Broadway. From its opening, Sloane’s shop catered to the carriage trade and it appears his was the first to offer Persian rugs in New York City. Two of the luxurious carpets would end up in the Skidmore house. In 1845 Samuel Skidmore purchased two Persian rugs from Sloane for $25 each – in the neighborhood of $750 each today. Skidmore was the head of Skidmore & Co., a wholesale drug firm at No. 58 Cedar Street. His friend, John R. Townsend had been Judge of the Superior Court in 1844. So well respected was he that when he died two years later the members of the bar wore mourning for 30 days. The Townsend family recognized Skidmore's integrity and astute business sense and put the significant estate in Skidmore’s hands. The extent of Skidmore’s own fortune was evidence on September 18, 1860 when he came to the financial aid of the City. New York City was $3 million in debt and on August 11, 1860 the Common Council passed an ordinance whereby private citizens and companies could buy city stock. Called “The Floating Debt Fund Stock of the City of New-York,” it was hoped to liquidate the city’s debt. Skidmore purchased $2,000 worth of stocks—more in the neighborhood of $55,000 today. By now the Skidmore children were maturing and a nurse was unnecessary. But the Irish-born Mary Ann Banks was elderly and, according to The New York Times, was “looked upon as one of the truest and most faithful friends of the family.” Samuel Skidmore told Banks she could stay on in the house as long as she pleased. Although Samuel Skidmore was active in Trinity Church and since 1845 had been a vestryman there, Mary chose St. Ann’s Church and was confirmed there in 1860. Around a year later Mary’s brother arrived to visit. He calculated that his sister’s age at the time was around 83 years old. “In regard to her age, Mr. Skidmore said that she had always insisted that she was born a short time before the Declaration of Independence,” said The Times. Mary Ann Banks was fond of retelling the story of the day she had shaken hands with General George Washington, and said that she frequently would see Martha Washington on the street. Fearing she would be a financial burden, the aged woman was concerned that she would have enough money to pay for her own funeral expenses. She took $100 to the Bleecker Street Savings Bank and deposited it as her nest egg for when the time came. Skidmore’s business and fortune continued to grow. 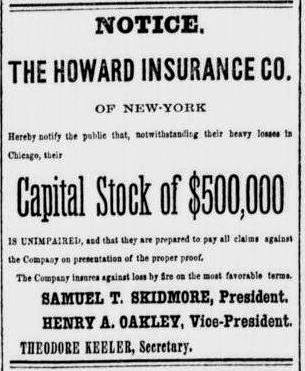 By 1871 he was President of the Howard Insurance Company of New-York and would become a trustee of the U. S. Trust Company. In October 1875 the Skidmore’s faithful servant, Mary Ann Banks suffered a stroke which left her paralyzed. Her mental faculties were unimpaired, however, and she wanted desperately to see the Centennial Exhibition being planned for 1876 in Philadelphia. It would not be. On June 27, 1876 The New York Times reported “Mrs. Mary Ann Banks, who had lived with the family of Mr. Samuel T. Skidmore, of No. 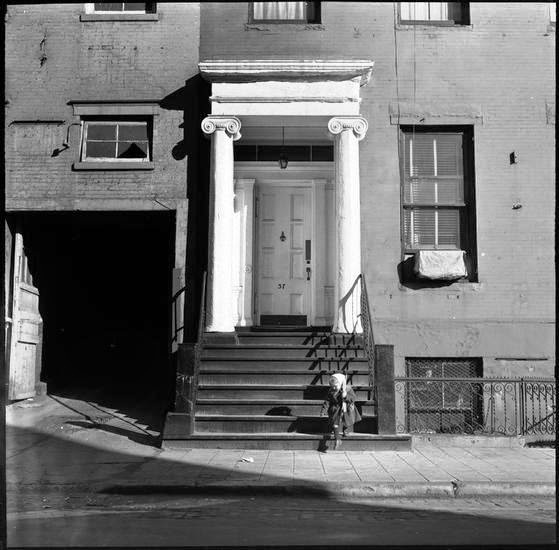 37 East Fourth street, for over forty-five years, and who has said to be more than one hundred years old, died at his residence yesterday morning.” Mary’s concerns about her funeral expenses were unfounded. The $100 she had left in the bank years earlier had grown to $250. Her funeral was held in St. Ann’s church on June 27 at 10:00 a.m.; after which she was buried in the Skidmore family lot in Greenwood Cemetery. Skidmore himself was aging and within the year he requested to be relieved from his duties of the Townsend estate “on account of his feeble health and his advanced age,” as explained by The Times on March 16, 1877. The family refused to have an accounting of the estate, saying that Skidmore’s flawless ethics made it unnecessary. Samuel T. Skidmore lived for another four years, dying in the house on November 8, 1881. By now the once-elegant neighborhood was falling victim to commerce. The wealthiest families had long ago moved northward and the spinster Tredwell sisters at No. 29 and Angelina Skidmore were among the last of the private homeowners on the block. Angelina stayed on in the house for just two more years, selling it in 1883. The couple moved into No. 37 East 4th Street; but the honeymoon was soon over. Payne shortly neglected Lillian “and her friends say that she was obliged to go back to skirt dancing to pay the rent for their little home and buy food.” Eventually Payne “tired of her” and the couple separated, Payne remaining in the 4th Street apartment. Although Lillian had her husband arrested around March 1893, her witnesses failed to show up and the case was dropped. He convinced her to move back with him at the beginning of July, saying he would support her so she would not have to continue dancing. The night of Saturday, July 8 was Lillian Payne’s last night of skirt dancing. She left the theatre in Jersey City and reached home around 2:00 in the morning. She found her irate husband waiting for her. Before Lillian could reply Payne seized her by the throat and threw her against a wall. When she pleaded with him, he “gave her a terrible kick in the abdomen,” said the newspaper. Severely injured, the teen made it out of the apartment and onto the street; but she lost consciousness in front of No. 85 East 4th Street. It was not until around 3:00 that morning that Policeman Wichman found Lillian unconscious on the rain-wet pavement. She was taken into the home of Dr. C. E. Hirsch where she finally regained consciousness and told the policeman what happened. “Dr. Hirsch administered opiates, and then the policeman arrested Payne,” said The Times. In court he denied assaulting his wife and said she came home intoxicated. The judge held him without bail. While the once proud home continued to house renters, the rear of the building was used as a factory by 1895. That year the Annual Report on Factory Inspection listed Harry T. Kremer’s artificial flower factory here, employing seven men and one female. In 1901 the space was used by Spitz & Co., manufacturers of “muff linings.” Spitz’s small operation employed three men and eight women and, like Kremer, surprisingly hired no one under the age of 16. The new owner’s admirable plans and the subsequent landmark designation in 1970 would seem to have guaranteed the structure’s future. Nothing could be farther from the truth. In 2010 the AIA Guide to New York City lamented “with each edition of this Guide less remained [of the house].” The Samuel T. Skidmore mansion was near collapse. In 2002 the roof had caved in. Within the previous few years, according to Margaret Halsey Gardiner, executive director of the Merchant’s House Museum (the old Seabury Tredwell house), “with each passing year and each fire and each wall collapse” more of the original elements—shutters, doorknobs, the stairway newel post—were spirited away . The Atlantic Development Group leased the abandoned house, the windows of which were by now bricked up. Working with the Landmarks Preservation Commission and conservationists, the firm of Gerner Kronick & Valcarcel Architects studied period houses and Thomas Thomas & Son’s original drawings. Although the original details evident when Touchstone gallery was here had been ripped out or lost through fire and decay; the exterior was intact although highly abused. By November 2010 the $4 million restoration and conversion to apartments was completed. Amazingly, the Skidmore house—snatched from devastation at its final hour—is reborn. A reproduction cast iron fence approximates the original and six-over-six windows fill the openings, once bricked shut. The sidelights and transoms of the entry have been restored and, most miraculous, the original door survives.